From late January of this year through mid-April, cash gold held in a tight range of approximately 1300 to 1350. Several times in our commentaries we stated a high expectation that gold would breakout to new recovery highs. In addition to positive technical action, our expectation of strong fundamental support was based on a continuing rise in the inflation rate, moderate real interest rates, the increasing quantity of government debt in excess of GDP growth, and an expectation that dollar weakness would resume, given the dollar’s overvaluation on a purchasing power basis. Instead gold has declined from mid-April level of 1350 to a low of 1200 in the past week. What explains the weak price action in gold and will it reverse? The quick answer is that we are in the midst of an economic war emanating from the imposition of tariffs by the U.S. on other parts of the world, which strengthened the dollar, and weakened other key currencies. A strong dollar causes the gold price to weaken all else remaining the same. The result of the other currency declines has, in many cases, resulted in largely offsetting the impact of tariff increases. It appears that the Chinese have encouraged the depreciation of their currency, the Yuan, as an overt attempt to get back at the U.S. The U.S. is the world’s largest economy, and also runs a monster trade deficit. As a result other parts of the world stand to be net losers if they impose similar tariffs on the U.S., for the simple reason that they sell more to us than they buy from us. China cannot win an economic battle with the U.S. on tariffs alone, because they sell us roughly four times what they buy from us. However they have three other options. They can create technical roadblocks for U.S. companies doing or wanting to do business in the U.S. To some extent they have been engaging in this. However the two big arrows in the quiver are currency manipulation and sale of U.S. Treasury securities. To date they do not appear to have executed any significant Treasury sales. Interestingly, Russia in April and May liquidated almost all of their Treasury holdings and simultaneously bought gold. Will China follow suit with Treasury sales? Recently China has also initiated multiple fiscal and monetary stimulus policies to strengthen its economy. It is also believed that they have been regular buyers of gold. China is also the world’s largest gold producer. All mined gold must be sold to a government agency. China is secret about their gold holdings, and based on opinions of knowledgeable observers, probably holds a much larger gold position than publicly reported (They report with a several year delay and may have holdings in multiple accounts, not all reported). What will be China’s actions going forward? President Xi is now President for life and does not have to worry about midterm elections, as President Trump does. China views itself as a rising power and the U.S. as a waning power. They do not view the tariff issue as purely an economic negotiation and are unlikely to negotiate in a friendly manner. China has made it very clear for several years that they do not like the U.S. dollar as the world’s reserve currency. In this regard they have continued to negotiate bilateral trade deals with other countries so that the dollar is no longer needed to settle these trades. Recently they created a Yuan petroleum futures contract along with a Yuan gold futures contract. Since oil is the largest commodity market, and China is now the largest oil importer, their goal appears to be moving oil trading to Yuan and away from the dollar. It was the U.S. in 1973 that persuaded Saudi Arabia to sell oil only in dollars which set the standard for the dollar as the world’s reserve currency. China’s goal is clearly to move the world away from trading in the dollar. China knows that Trump is increasingly vulnerable as November approaches. Trump is particularly vulnerable in the farm belt or if the stock market declines. The last time the Chinese weakened the Yuan was from mid-2015 through 2016 which caused a sharp selloff in the U.S. stock market in late 2016. Since China has already used currency depreciation it is quite possible they will shake up the Treasury market with partial sales of their large holdings. Such an occurrence would both destabilize U.S. financial markets and in all likelihood weaken the dollar. While they do not want a significantly weaker dollar, given their large Treasury holdings, they do want to continue to weaken or eliminate its role as the world’s reserve currency. U.S. citizens have a dollar centric view of the world. However, if one tries to think from a foreign perspective, would you want to hold your excess currency reserves in the dollar given the message that the U.S. is sending the rest of the world with regard to trade. The U.S. cannot continue indefinitely running massive balance of payments deficits and public debt increases in excess of economic growth, and expect the rest of the world to continue to finance these deficits. If the Trump administration succeeds in massively reducing our trade deficits, our domestic economy will be forced to buy the increasing issuance of debt to replace former foreign buyers. Alternatively the Federal Reserve may be forced to finance the deficit. This is likely to lead to both higher interest rates and inflation. It is also likely to lead to renewed weakness in the dollar. History demonstrates that every previous world currency eventually loses its position to some other system. The British pound, the previous currency to hold that position, was eliminated in the aftermath of financial strains from WW I. The world then entered a no man’s land until Bretton Woods enthroned a gold backed dollar in 1944 as the new reserve currency. This lasted until mid-1971 when the U.S. stopped redeeming dollars for gold. This left the world on a fiat dollar system which still operates but is losing its cache. Being free of the obligation of a gold backing, the U.S. has been able to run far larger deficits for many more years. However, there will still come a point where unlimited dollar acceptance will be called into question. The tariff war may hasten that point. The fiat dollar reserve currency system has lasted for 47 years based initially on Saudi acquiescence in the early 1970s to price oil in dollars, given that the U.S. was the largest oil importer. Other countries also accepted the dollar given U.S. military strength during the cold war, given our large economy, and our willingness to run large trade deficits. World economic conditions have changed dramatically in 47 years. China is now challenging the U.S. on both economic and military grounds. The idea that government deficits don’t matter and that foreign governments will finance it indefinitely is a fallacy. Whether the tariff disputes end peacefully or in all out economic war is an unknown. Either way events have probably been set in motion that will further weaken the reserve currency status of the dollar. A period of uncertainty may result. Gold is likely to play a more central role in the future. Given the massive level of all governments’ debt creation, a substantially higher price of gold will be required to support any new system. 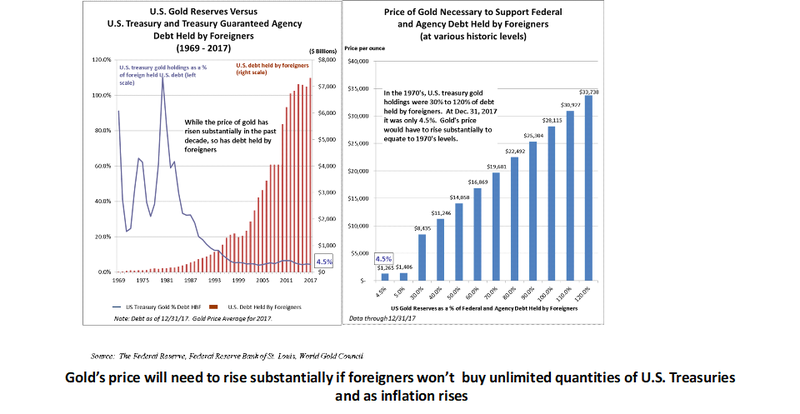 For the U.S. to have a gold cover of its foreign debt comparable to levels in the 1970s, gold would need to exceed $10,000 an ounce. In summary, recent dollar strength and gold price weakness is in all likelihood temporary. U.S. policy intended to reduce the trade deficit will hasten the dollar’s loss of status as the sole reserve currency. As with the period between the two world wars, the global economy is likely to move to a period of greater currency uncertainty. Dollar weakness will place greater strains on the U.S. economy, likely leading to higher inflation and higher interest rates. As the world economy searches for solutions, gold’s status will increase as will its price. Given the massive and ever increasing levels of government debt, gold’s price could be driven to levels several multiples of its current price. If gold’s price rises dramatically, as we believe likely, gold mining companies will have even more upside leverage.